A plasma in liquid is applied to the decomposition of the chemical compound or the material synthesis. In this special issue, we present the recent situation of the plasma in liquid. 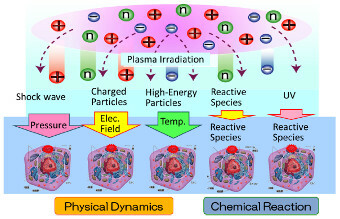 Plasma water treatment for organic decomposition is promising as an environment-friendly treatment technique because organic compounds are decomposed by chemically reactive OH radicals produced by the plasma without producing by-products. In this paper, water treatment using microwave plasmas is discussed, especially focusing on the pressure control during the process. 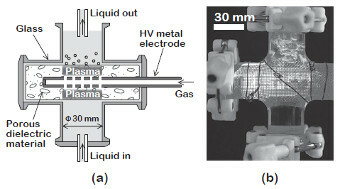 Using a microwave plasma source where a slot is immersed in the water, improvement of the plasma ignition is shown at reduced pressure condition. 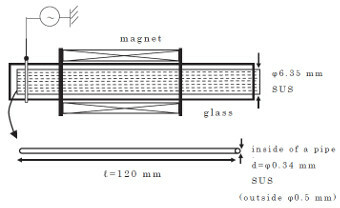 As an alternative technique to enhance the plasma production ultrasonic wave is superposed to the microwave plasma. By synchronizing the ultrasonic wave and the pulsed microwave, enhancement of the organic compound decomposition is realized. As a new treatment technique of flowing water by the plasma, a microwave plasma source that utilizes a nozzle to produce the reduced pressure is developed. High efficiency organic decomposition is demonstrated under flowing water condition. In materials processing using plasma in contact with liquid, plasma plays an important role as a trigger to promote primary processes at the plasma/liquid interface. However, direct effects such as radicals from plasma vanish after traveling a few or a few 10 nm from the plasma/liquid interface. The rest of the processes in liquid proceed only deep inside the liquid where the direct effects of plasma are no longer expected. This situation can be regarded as robustness in the process. However, at the same time, it has a negative aspect of poor controllability by plasma. In other words, the factor of “the unique to plasm” governs only the limited part of a whole process. In this paper, we survey recent research activities on materials processing using plasma in contact with liquid from the view point mentioned above, and discuss why we use plasma. A pulsed discharge plasma in water and in contact with water have been attracting much attention as a promising technology in various fields such as agriculture and environmental remediation. 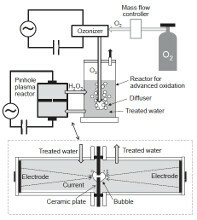 The pulsed power technology enables the instantaneous production of non-thermal plasma which produces various chemical species, such as hydroxyl radicals and ozone. These species play an important role in sterilization effect and the decomposition of organic compounds in wastewater. In this paper, characteristics of plasma discharge inside bubble generated using a pulsed power generator and chemical are described. The decomposition of persistent organic compounds such as 1,4-dioxane, formic acid and dichloromethane by the plasma discharge are demonstrated for environmental application. 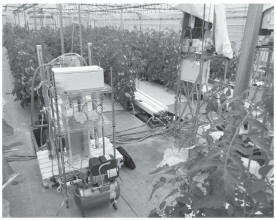 A nutrient solution treatment system using plasma is developed for practical use in hydroponics for agricultural application. Its performance of enhancement of plant growth rate and inactivation of bacteria in nutrient solution are demonstrated. We have experimentally investigated the effects of gas-liquid interfacial plasmas generated by jet type and in-solution pulse discharge type plasma devices on drug molecule transfer through the cell membrane toward developing minimally-invasive and highly-efficient drug transfer system. After the plasma generation above adherent living cells (direct plasma irradiation), the drug-simulated molecule (YOYO-1) transfer into the cells was clearly observed. In addition, it was observed that the YOYO-1 transfer was also enhanced after indirect plasma irradiation, and efficacy of the solution treated by the in-solution type plasma device was significantly higher than that in the jet type one and was suppressed by the addition of OH scavenger. OH radical measurement showed that the duration of OH radical generation using the in-solution type plasma device was longer than that in the jet type one. These results imply that OH radical as short-lived reactive species is one of the factors which enhance the YOYO-1 transfer. A plasma generated at the water boundary can be a useful tool for water purification or hydrophilization of multilayer graphene powder. A combined ozone/plasma system was proposed for mineralizing a high density persistent substances in water. A multiple pin-hole plasmas increased the hydrogen-peroxide supply rapidly for advanced oxidation processes. The mineralization speed was increased to 0.4 gTOC/L/h at the energy efficiency of 0.5 gTOC/kWh. Hydrophilization of multilayer graphene powder suspended in water was conducted using Ar plasma generated above the solution. Hydroxyl group were modified to the multilayer graphene and the dispersibility was improved with very short treatment time of several minutes. CNTs generated by underwater arc discharge are broadly classified into two types according to diameter. 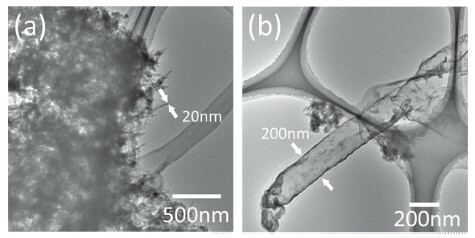 Multi-walled nanotubes (hereafter, MWNTs) between 20 nm and 50 nm in diameter, which is the normal diameter range of CNTs ; and large carbon nanotubes (hereafter, LCNTs) with relatively large diameters of between 100 nm and 300 nm. These two types are generated simultaneously. Assuming that the difference in diameter of these products is due to arc discharge intensity and water temperature, this study conducted underwater arc discharge under low and high temperature conditions and compared the diameter and generation ratio of the products. 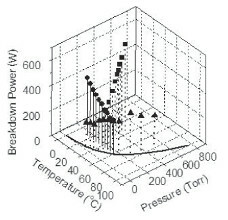 Conducting underwater arc discharge in a low water temperature environment between 20°C and 50°C and in a high water temperature environment between 80°C and 100°C, and comparing the diameter and generation ratio of CNTs generated in each temperature range confirmed that, at both voltage/current values, many LCNTs were generated under the high temperature conditions and many MWNTs were generated under the low temperature conditions. 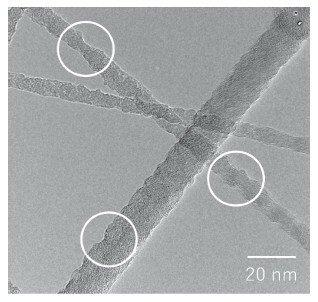 We evaluated structural modification of multi-walled carbon nanotubes (MWCNTs) before and after irradiation with highly charged ions (HCIs) produced by electron beam ion source (EBIS). Interaction of HCI with surface results in emission of many electrons and ions and modifies the structure of surface layers over nm region. We used transmission electron microscopy (TEM) as evaluation method of structural change. MWCNTs were prepared by chemical vapor deposition (CVD). TEM images of MWCNTs irradiated with Ar14+ exhibit uneven surfaces at the fluence of 6×1013 ions/cm2. This kind of structural modification is not seen in the case of Ar+ and electron irradiations, therefore the uneven surface is considered to be caused by the potential energy of HCIs, that is potential sputtering occurred on the surfaces of MWCNTs. Desorption yields obtained from a KBr(001) surface irradiated by 1.5–3-keV electrons have been measured via layer-by-layer mode removal. The yields are obtained from the inverse electron fluences required to remove the monolayer, which are measured from the specular intensity oscillations of 15-keV protons incident on the surface with small angles (≤1°). The desorption yield dependence on electron energy and beam current density (range : ≤100 nA cm−2) of the incident electrons has been measured while varying the sample temperature (350–470 K). The electron energy dependence is weak, and there is no apparent beam current density dependence. However, the initial half-period of the intensity oscillation curve tends to extend, and the oscillation shifts to higher electron fluence with increasing electron energy, electron beam current density, and decreasing sample temperature. A possible explanation for the aggregation is provided via attributing this result to the existence of aggregated F centers. Silver oxide (Ag2O) is known to be a p-type semiconductor with a narrow band gap (1.2 eV). Lower temperature processes are needed to form the oxide films because the oxide is reduced by heat-treatment over 200°C by dissociating the oxygen. This report describes fabrication of silver oxide films at lower temperatures using a reactive plasma assisted deposition with applying a substrate bias voltage (Vs). According to XRD analyses, silver films have been deposited by bias free deposition with a lower oxygen partial pressure while mixture of Ag2O and Ag films have been fabricated with a high oxygen partial pressure. 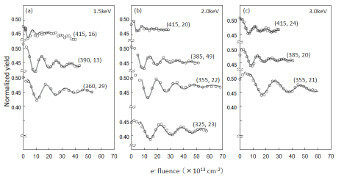 In the higher oxygen partial pressure environment, applying a substrate bias made silver react to oxidize such that Ag2O films were fabricated by applying a Vs = −20 V, and −40 V. The device structure of silver oxide film deposited on n/n+-Si showed good rectifying I-V curve and 0.25 V built-in potential.